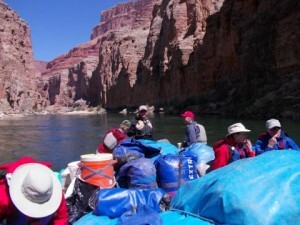 My husband and I traveled with our two best friends on the seven day Grand Canyon trip starting from Lees Ferry in mid-April with Western River Expeditions. Evan and Joe were our expedition leaders and they were great! Morning temps were a bit cool at first, so rainwear on the boat was a must and at night we wore fleece shirts. By the third night we were all out sleeping under the stars on our cots. Breakfast was about 6 am, then, break down camp and back on the Colorado River by about 8 am. Each day we had stops for hikes and lunch with making our next camp around 4 pm. Meals were delicious. We brought our own cans of beer and boxed wine. Bathing was challenging, as river water temperature is always 50 degrees. Some hardy folks jumped right in. Not us, lol! We went knee deep and washed our hair with a bottle pour. I recommend taking a sun shower, but all water must be dispersed in the river, so you would need a buddy to assist at water’s edge. Also bring a small pump bottle of WD40 as the zippers and clips on tents and bags get tough as the week wears on from sand exposure. The scenery is just breathtaking. Hiking is over rocky terrain, so wear sturdy shoes. This was my first white water river trip and my husband and I are in our 60’s. I am not familiar with all of the rafting companies, but Western River Expeditions was fabulous. The trip is not cheap, but the experience is worth it. 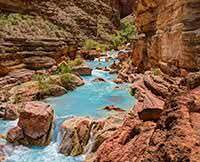 If rafting the Grand Canyon is on your bucket list and IF you can handle survivor camping for a week and IF you want to experience the sheer awe and spiritual uplift from seeing nature at its finest, I highly recommend.